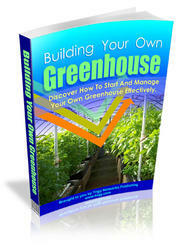 Whim choosing a greenhouse much depends on the site selected, the kind of plants one wishes to grow and. of course, the amount of money one is prepared to spend. All modem greenhouses, whether of wood or metal construction, incorporate the minimum amount of either of ihese materials to allow in the maximum amount of light. 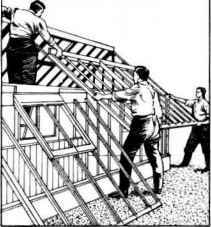 With this in mind the strong, lightweight, non-rusting alloys of which most metal houses are nowadays con-strucled must always win, but wooden houses will always, one assumes, be favoured by many gardeners who find wood a much more sympathetic material both to handle and to look at. The slim glazing bars and large panes of glass in metal houses admit a great deal of light -of special importanoc in the winter months - and maintenance work is minimal. On the other hand, greenhouses made of softwood will need painting every other year if decay and general deterioration is to be avoided and they are without question more difficult and costly to maintain. The warmth and moist atmospheric conditions inseparable from the good growing conditions demanded b\ so many plants has a detrimental effect on unprotected wood. Greenhouses of cedar wood construction need brushing down occasionally with a teak oil or an oil sold specially for this purpose, but they do not need painting. However, their higher price must not he forgotten. Perhaps it would be helpful if I described briefly my own four greenhouses and what I use them for My Ifi ft. by 8 ft. light alioy greenhouse is divided into two sections, one being kept at a high temperature for the cultivation of those plants needing such conditions during the winter and the other section being reserved for plants needing cooler conditions. In this way heating costs are kept down. 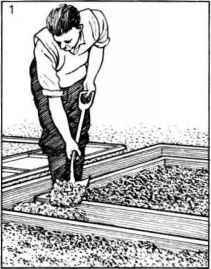 This is an arrangement which would suit many amateur gardeners for it greatly widens the range of plants that can he grown, thus creating a greater challenge for the gardener. and other flowering plants are grown. The third greenhouse, measuring X ft, by 10 ft., is of the Dutch-light type and represents, 1 think, the best value for money at the present time. Made of cedar wood and with glass to the ground I have fitted it up with an ash bed on one side for the ring culture of tomatoes and for the accommodation of pot-grown chrysanthemums in the winter months, and on the other side with staging which allows a wide variety of plants to be grown both on and underneath the staging. The fourth greenhouse, 18 ft. by N ft., is of the lean-to kind against a west-facing wall. This is constructed from a mixture of oak and metal and ] use it to grow fan-trained peach trees on the wall with a vine growing along the top of the structure. Perpetual-flowering carnations grown in pots on staging facing the peaches provide flowers for cutting throughout the year. One final piece of advice to all prospective greenhouse owners: do make an effort to visit a centre where greenhouses are displayed before making your final choice. Just walking around a greenhouse and observing its special features can tell you more in a few minutes than many hours of browsing over catalogues. An observant eye will soon spot the strengths and weaknesses of particular models and it will then be possible lo relate them to the job you wan! them to fulfill.